Ten Spoon Winery is a short ten minute drive up a canyon from downtown Missoula. The winery sits just off of Rattlesnake Drive, which leaves downtown as N. Van Buren Street and heads straight north. At one point, there is a sharp right turn to stay on the main road, however it is very clear which direction you ought to head! The winery pops up on the left hand side, as you are heading north, with a few dozen vines appearing first and a one way driveway shortly after. Pulling off the road, you drive past the main building and have your choice of parking in a rather large gravel lot. If you are lucky, you will spy a songbird poking its head out from one of the several bird feeders along the fence line. I hope you remembered to bring a picnic! You can enter the tasting room from the front of the building, off of the driveway, or you can go around to the gorgeous lawn full of chairs and tables, then up the back steps. The tasting room has a lovely vibe to it, being decorated quite nicely, though it does double as a warehouse. If the weather isn’t as delightful as you had hoped, you can sit at one of the tables inside. Ten Spoon Winery makes around ten wines and offers you two choices when it comes to tasting. You can enjoy a single glass of wine for around $8, or a tasting flight of four wines for $10. Yes, they accept plastic. Your tasting comes with a small side of bread sticks. You can also purchase an antipasto plate, if you need something to nibble on. Patrons are limited to three tasting flights or three glasses of wine. The wines available include some grown a few dozen yards from the tasting room, as well as those made from grapes selected and transported personally by the wine maker! The cherry dessert wine really is a dessert wine, I can attest to it! Other options from Ten Spoon include pinot gris, pinot noir, and several blends. Having selected your wines, move out to the back lawn and take up residence at one of the tables. The view is delightful and the large lawn means the tables are spaced out appropriately. You do not have to dance between tables and become overly acquainted with your temporary neighbors. There is even a kids table and kid sized chairs. In fact, the lawn makes a perfect setting for a picnic! Picnicking at Ten Spoon Winery is absolutely encouraged. Sip your wine, snack on some charcuterie, fruit and cheese, and socialize. When we visited, there were several different groups enjoying a picnic. 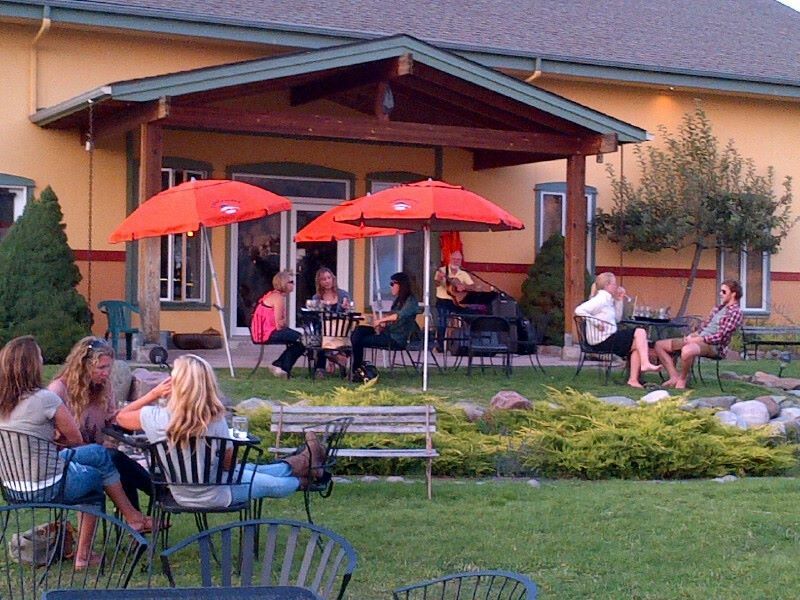 The winery welcomes all ages, making it a lovely family evening, a great date night, or a fun place to relax with friends. Ten Spoon is also conveniently located next to Missoula mountain biking trails. You can come early, hit the trails and then finish off your day with a glass of wine and a picnic. The tasting room is open Thursdays through Sundays in the evening, from 4pm to 9pm in the summer, and Friday and Saturday evenings in the winter. During the winter, musicians add an extra touch to the setting on Saturday nights and through the summer they also play on Fridays. Who would have ever guessed that Missoula, Montana would be home to a vineyard and a winery? The next time you are in the area, stop in for a lovely evening out.